Under the Oak Tree: Feeding "The Hungry Hippo"
Hi! 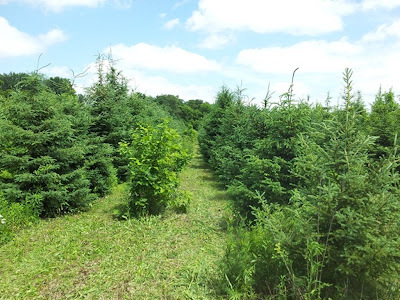 For those of you who have not met me yet, my name is Lyndsey, and I am a summer intern at the tree farm. 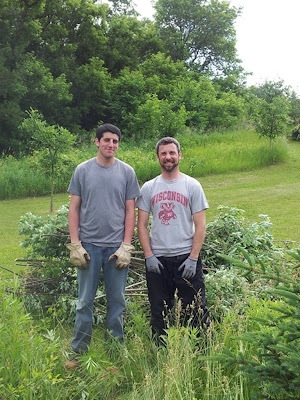 I am working at the farm in partnership with the Aldo Leopold Foundation (ALF). I spend three days a week at ALF and two days at the farm. While at the farm I spend most days working with Arik. We began working on a timber stand improvement (TSI) project on June 12th. We are working in the Spruce/ Hardwood stand just north west of the Husker Barn. The stand was planted in 2000 with goals of tall straight hardwoods. The Spruce is planted to increase the straightness of the hardwoods. 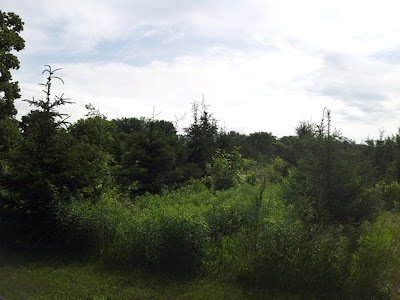 The plan is to remove the spruce for pulpwood after about 30 years to allow the hardwoods to better utilize the space and nutrients. The picture above shows what the stand looked like before we started the project. The stand has rows of Spruce with rows of oak, walnut, and hickory between them. We have been working hard to clean up the rows and remove some of the under story species. We are hoping to improve the quality of the Spruce and hardwoods by removing competition. 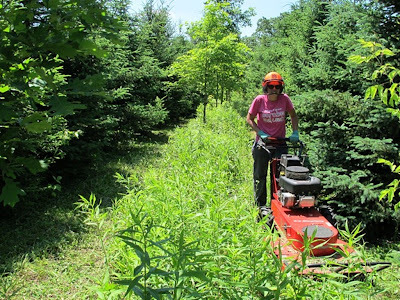 We are removing invasive plants such as buck thorn and honey suckle along with other nuisance species such as box elder, multiflora rose, wild grape, and aspen. I don’t want to leave the impression that we think all of the trees are always a nuisance, but we are selecting to remove them from this stand. Arik identified a “new to us species” in the stand as well, Bebbs Willow (Salix bebbiana), which is also being removed. Improving the aesthetics of the stand also ranks high on our list of priorities. We are hoping to eventually prune some of the lower braches of the Spruce. Improving the stand is no easy task, but working as a team we are able to get through a row or two each day. We begin by using a brush saw to cut down any of the unwanted trees and shrubs. Most of the species we are removing are notorious for stump sprouting. If we were to cut them and leave them as they are, they would send up sprouts via the stump, and come back thicker. In order to remedy this problem we treat the stumps with Garlon 4 mixed at 24% percent ratio with diesel fuel. For more information on Garlon, check out this link! This is a picture Holly snapped of me while using " The Hungry Hippo"
"The Hungry Hippo" has a 25” cutting width and will eat almost anything in its path! Now, rather than hauling the brush out, we have decided to just leave it in the rows and go over it with “The Hungry Hippo.” It saves time and energy doing it this way and will return the nutrients back to the soil instead of removing them from the stand. On Tuesday Graham and Aaron lent us their muscles by helping with Garlon treatment and brush removal. Thanks for your help!! Graham will be joining us most afternoons to help with this project and others! All in all I think it will be gratifying to see this project completed! I will provide pictures of the finished stand as soon as we complete it! This is what it looks like so far. Birds of all shapes, sizes and colors!